Look for 6 new titles from Harlequin Desire every month! Harlequin Desire: Wealthy heroes with hearts of gold… family sagas… scandalous secrets… burning desires. 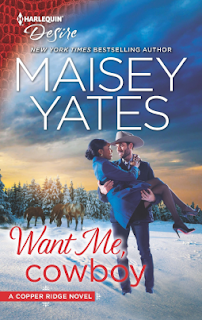 It's always a treat to read a western romance by Maisey Yates. Want Me, Cowboy is no exception. In fact, I enjoyed it more thoroughly than any other book I've read from Maisey Yates because it features an interracial romance! I was so excited when I saw the cover, reading the story was the icing on the cake! I loved the dynamic of Isaiah and Poppy. The years of their long friendship shows in the way they work together and know how to read each others' moods. That's what makes this story so captivating, because as well as they know each other they still get it wrong. It's endearing and heart-wrenching at the same time because you want to see them find their way to each other, but they let overthinking get in the way of possibly finding true happiness. The story moves quickly but I didn't feel as though anything was left out. Maisey Yates hit all the right marks for a full, enjoyable romance: drama, introspective musing, explosive confrontations, and tender moments. Cooper Ridge fans will love this addition to the series! Want Me, Cowboy encompasses the everything you'd expect from a Harlequin Desire title. Family, secret desires, and in this case a smoking hot, wealthy cowboy!